On making the clever long-distance relationship movie so it can be enjoyed with all the senses. In the ten months since “The Lunchbox” debuted at the Cannes Film Festival, Ritesh Batra has seen his inbox full of incredible stories from people who have wanted to tell him after he’s shared his with them, some from people who literally can’t even see the film. Such a note speaks to the all the senses that Batra and his cast and crew arouse with the crowdpleasing tale of a middle-aged Indian government employee (Irrfan Khan) on the eve of retirement who gets a little spice thrown in his life by way of an errant delivery of a lunchbox prepared by the lonely wife (Nimrat Kaur) of one of his fellow employees, an accidental delivery that leads to a relationship of letters between the two who find comfort together while confronting an unknown future. 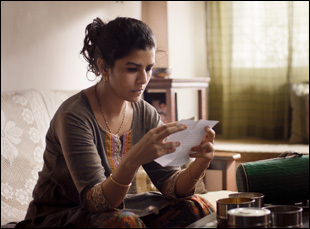 With its crisp cinematography from frequent Ramin Bahrani collaborator Michael Simmonds and its cleanly delineated storytelling, “The Lunchbox” exudes a different energy than most other films from the region – an intentional choice on the part of Batra, who hired an international crew – and yet it is filled with the richness of culture that exists there, making it all the more devastating that Khan’s widowed Saajan and Kaur’s unhappily married Ila feel as if something’s missing from their lives. Yet just as we’re informed of Ila’s tendency to make her paneer particularly piquant, “The Lunchbox” is as much about finding joy as it is about yearning for something more, resulting in something extraordinarily satisfying not only for the audience, but for Batra, who had originally planned to make a documentary about the Dabbawala delivery service at the story’s center that brings hot lunches from homes to offices with (typically) unfailing accuracy. Of course, life had other plans for the filmmaker, not only in making the film, but everything that’s followed with his first child born during production and a rollout of “The Lunchbox” around the world as it’s premiered at Toronto, London, Torino, Dubai and Sundance. Fortunately, he also briefly stopped in Los Angeles where I was able to talk to him about making a film essentially divided in two between its two lead actors, telling a story through food and how to maintain a sense of humor that can cross cultural boundaries. Did this feel like making two different movies since your two lead characters are in a long-distance relationship? In many ways, it was like shooting two different movies, but at the same time, it needed to be one. We shot Irrfan’s portion first. We shot this movie for 29 days with the principal actors and then for one week, me and the DP Michael Simmonds followed the green lunchbox in the system. And visually, to some degree, it was like shooting two different movies because you know when [Ila’s] cooking in the kitchen, Bombay apartments are much like New York apartments – they’re very small and just by having that constraint, we had to be handheld. Our camera was pretty big — it was an Alexa — so we had to be handheld many times, but then again, she’s in the prison of this house and she’s trying to change her life, so that constraint really brought that aspect to life about her being more active than [Saajan] as a character because he’s a pretty passive character. At the beginning of the movie, he just wants to be in his own prison of his past and his is the world of his office and his home and the commute and hers is just this world inside this apartment. When you put the two sections together, were you able to make discoveries you hadn’t thought about before? Absolutely. We really crafted it in the editing, so there were a lot of discoveries. Ila’s last voiceover, the voiceover that I feel brings the whole story together, I wrote during the edit. It did not exist in the script and I always felt like something was missing, in her story especially. The whole movie seemed a little weighed down on the other end because of that and once I wrote that voiceover, there was balance for the whole thing. But you make so many discoveries in the edit. There were some things I was very protective of since the writing, like these magic realist flourishes with the fan and the flies and I knew those cut points that would take us [to different scenes], and also like a song that would start on one end and continue at the other end — I wanted these things to connect because this film moves on that line between mistake and a miracle. This lunchbox delivery [being] the wrong one – is it a mistake of the system or a miracle of the big city? I was protective of those flourishes, even in the edit. But aside from that, everything else was up for discovery. Did the fact that you yourself split time between India and New York have any impact on telling this story about a long-distance relationship? No, but it’s an interesting question because someone asked me about the funeral scene [in the film]. And so much of this movie for me was telling the actors it has to be funny and sad. That it’s funny one minute, then it’s sad and then again it’s funny, so we would always talk about those scenes. And the funeral scene is a good example because in the West, and just from having lived in the States for so long, it’s like when someone dies, we get together, we celebrate their life and everybody has a drink. There’s a ceremony to it about celebrating someone’s life. In India, it’s a different kind of ceremony in that everybody is somber, for good reason. Someone is dead and there is no celebrating a person’s life. You are just mourning that person’s death. I don’t know what is right, but that funeral scene has both in it. Is that why it was a conscious choice to have an American cinematographer and an American editor? Definitely. I didn’t know Michael [Simmonds, the cinematographer] before the film, but I went to the Sundance Institute and they really were the force behind it happening — the feature film program and Michelle Satter and her team — and they introduced me to Michael. Then of course, I had seen his work and knew in an instant that he’d be the right person to shoot it. It helped he hadn’t been to India before because I really wanted someone who would see things I don’t see because if you’re from a place, you generally don’t see a lot of things. As far as the editor, I really wanted to work with John Lyons because I had met him at the Sundance Labs and we had been friends since. That was more out of sharing the same set of sensibilities about movies and he loved the script. He got it instantly and what we were trying to do and I knew it would be easy for us to work together and make the same film. Was there a special significance to the specific dishes that were prepared in the film? Of course. Even in the script, but then we made it better in the prep and the shoot, the dishes were very tied to Ila’s journey as a character. At the beginning of the film when she’s trying to lose herself in her cooking, so she doesn’t see the problems in her marriage, the dishes have to be very complex, with lots of steps, lots of ingredients, but as the film goes on and their relationship deepens, the food becomes less important to her as a character. The dishes are still good, but they’re very easy to make by the standards of Indian cooking. We move away from the food for a while, then also come back to it and she makes those eggplants for him [which are complex], so the dishes were tied to her character and her evolution as a person. I actually read that your father had lost his job at 50 and started a new business. Did that contribute to Irrfan Khan’s character in any way? Lots of things contributed to that character. Irrfan had a reference of his uncle that he lived with when he first came to Bombay and there were a lot of nuances and details he would tell me about – the kind of bag he would carry, the kind of collar his uncle’s shirt had. I would write those things into the script. And my dad worked for the government for a long time and he had a routine and that also had a lot to do with it. But my grandfather also had the same job all his life, and he lived with us after my grandmother died. I shared a room with him growing up, so I got to see that loneliness when the spouse dies and you have to live out the last 20 or 30 years of your life alone. He was also a big smoker, so I’m sure there’s a lot of buried things that ended up in the character. You’ve said you wanted this film to travel – now that it has, what’s it been like to see the reaction to it? It’s a real blessing. You can’t anticipate these things, but it’s a real blessing to see it traveling and resonating and people bringing their lives to it. I’ve received real nice notes from around the world of people who saw the movie with someone they love. Someone sent me an e-mail from somewhere in Italy saying it was a cold rainy day and they saw it and it made their day. Someone else told me it was the last film that his mother saw before she passed away two or three days later and it made her smile, so these things are really, really special. “The Lunchbox” opens on February 28th in Los Angeles at the Royal Theatre and in New York at the Angelika Film Center 6 and the Lincoln Plaza Cinemas before expanding on March 7th to other cities. A full list of theaters and dates can be found here. on "The Face of Love"
Pingback Interview: Ritesh Batra on Bringing the Light into "Our Souls at Night"